Of course, it is also a good time for the religious right to make fools of themselves. Now they’re blaming the Gays for the San Diego wildfires, which begs the question of why West Hollywood, Hillcrest, Silverlake and Long Beach seem to have been spared the wrath of the flames so far! Within that paragraph was a link to a blogpost from James Hartline, a local religious nutjob and self hating gay man with AIDS, about how Hoe Moe sexuals caused the fires. Boi is a better man than I. I refuse to give that frak Hartline any traffic. You’ll have to go third party if you want to hear that idiot’s brainfried rant. Hartline is the same headcase who bent the Catholic Bishop of San Diego’s ear a few years ago so the late owner of Club Montage could not have a proper funeral. I’ll stop because I don’t have a kind thing to say about him. Larry Himmel of Channel 8 covers the destruction of his home during the fires. Normally someone with a great sense of humor, Himmel carries himeslf with a great deal of professionalism and does his job. My proverbial hat’s off to him. I’d be a definite mess if I were in his shoes. And then there’s the walkthrough. San Diego Fire, originally uploaded by Armida the Diva. This pic is eerie! 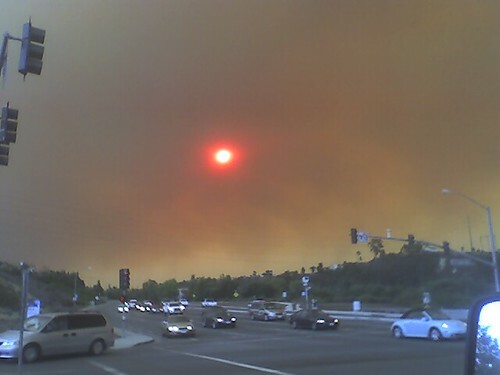 I don’t know where this is exactly, but this is one the spookiest pictures I encountered so far regarding the fires. The thought that part of the smoke comes from burned down houses is unsettling. My heart goes out to the people who have lost their homes so far. If you’re locally here in San Diego, tune in to 94.9 FM, which has kindly provided the signal for KPBS. Keep updated, be generous and donate to the evacuation centers (and show generosity in any way possible), and make sure those who lost their homes don’t get taken in by the hucksters. For those of you outside of Southern California, your thoughts and prayers are appreciated.